Why Should Teamsters Pay the Price for Wall Street Greed? December 9, 2011: When Wall Street greed crashed the stock market in 2008, my pension fund, Central States, lost $9.5 billion. This year, it will have to make $2.2 billion just to tread water. December 2, 2011: Sotheby’s, the auction house for the super-rich on Manhattan’s Upper East Side, pulled in $680 million last year. That hasn’t stopped management from demanding across-the-board concessions and the replacement of Teamster jobs with part-time, nonunion temp jobs. December 16, 2011: When 4,500 United Airline mechanics rejected the International Union’s proposed contract last June, they were told they would end up with something worse. December 16, 2011: UPS Freight Teamsters from a number of terminals including Akron, Indianapolis, Cincinnati, Kansas City, Orlando, Austin, Portland and northern and southern California have met by conference calls to form a national network and prepare for the upcoming contract. 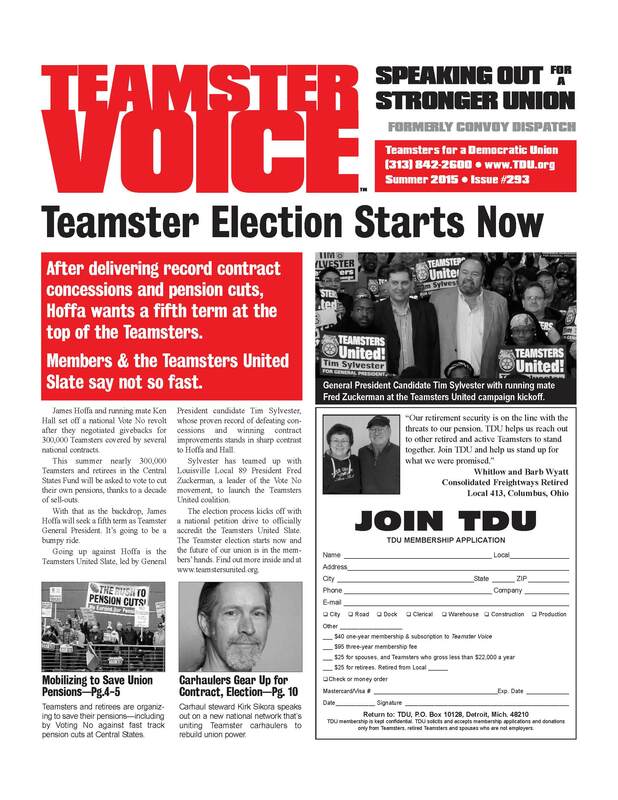 December 16, 2011: Hoffa and Hall have promised UPS will curb production harassment, hire more package drivers and respect members’ 9.5 rights. It’s up to Teamster members to hold Hoffa and Hall to their pledge and to Make UPS Deliver on these commitments. December 9, 2011: Jokes about bubble gum and bailing wire, band-aids and duct tape are commonly used to describe shoddy workmanship or slapstick repair in every workplace.